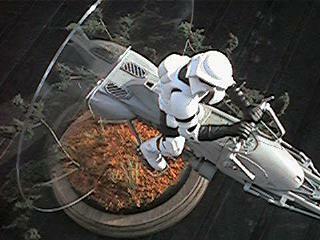 Ever since seeing the high-speed chase scenes in Return of the Jedi (ROTJ) I've wanted a speeder. Alas, the kit was only released in Europe (like the A- and Y- Wings). They say 'all good things come to he who waits' - and this time the nebulous 'they' were right: the speeder kit has been released in the US as an 'in-flight' display piece. Intead of the normal cheesy stand, the 'in-flight' kits sport a circular black base supporting a circular piece of clear plexiglass. A hole the size and shape of the model is cut out .... stick the kit in and voila', instant flight. I was dubious about the whole concept - and still am - but it works well with this kit. Score (1-10): 6 <*> Ease: (1-5) 2 (Simple Enough) <*> Verdict: Looks good on the mantel. The kit contains over 70 parts, including a base and clear plexiglas 'stand', and is molded in grey styrene. Detail is what we've come to expect from the Dyersville boys - adequate, but blurred at the edges and marred by mold seams and mis-alignments. Attachment points to the sprues are invariably thick and in awkward places - making clean-up a bear. No decals are provided (but none are needed). Parts fit is also standard for AMT ... meaning you'll need plenty of putty to hide the gaps. The four-page directions are generally adequate. The finished kit is about 2 inches wide and 11" long; the base is almost 6 inches diameter, and 11 inches tall. First off - wash the parts thoroughly in warm, soapy dishwater to get all the mold release residue off - worth the effort as this makes the paint adhere much better down the road. I wouldn't use "Blech-White" or oven cleaner - as some suggest - too caustic. The key to this kit is building by sub-assembly, painting, and then joining the sub-assemblies. 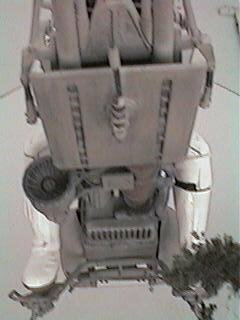 I built it up as top part, engine, front 'prongs' and Stormtrooper. Dry-fit parts along the way to get an idea of where you'll have to use filler and where you'll have to shave/sand down. After reading through the instructions, I decided to build in a different order - steps 1 - 5, 10, 11, 13, then back in sequence. Leave the Stormtrooper until the last. You'll need plenty of sandpaper and a good file to make this thing look good. There's not a lot of flash, but darn near every piece - especially the small details - is marred by a seam or a poorly-aligned mold. ARRGH!! The handlegrips and hoses underneath are particularly bad. You can overcome this by taking the appropriate size wire (stripped ROMEX - clad copper house wiring - works well for the hoses), bending to shape as needed, and wrapping them tightly with thread. Sand the parts numbers off pieces 51/52 and 71/72 - they're glaring if missed! I borrowed a few tips from armor modeling to improve this kit. Use the tip of your hobby knife to bore a small opening in the tip of the blaster. The tarp rolled up behind the seat is crap. I made small D-ring attachments from very thin wire and glued them where the tarp was supposed to go. I then painted a 6 inch X 10 inch piece of cheesecloth in a camoflauge pattern, folded it to approximately the right size, and attached it to the D-rings with two thin straps (strips of masking tape painted brown). I also replaced the cables running from the handle grips to the 'hood' with stereo wire, the strands twisted together to form a braid. The kit part is just way too thick. For the truly ambitious, use automotive electrical wire, wrapped with thread, to re-do the scuff bars under the footrests - a close examination of ROTJ shows they're completely wrong. Too late I discovered I needed to trim down the bottom edges of parts 71/72 about 1/16th inch each in order to fit into the base -- dry-fitting without the engine installed didn't show this. I was also noted after fitting it into the base that the speeder could only be shown going slow - at higher speeds the flaps over the engine are extended almost parallel with ground, something the base won't allow you to do. After looking at the trooper and test fitting the pieces, I decided AMT was testing my skills with really crappy molding. The body fits together OK, but there are huge gaps where the arms attach, and the feet don't fit in the bike's pedals the way the box art would lead you to believe. After gluing, filing, puttying and sanding, ... I decided to modify him too. I cut off his head and turned it sideways, so he'd be looking over his shoulder. Not a hard modification ... just saw off with a razor saw, sand down the edges, and glue back on with gap-filling superglue. Painting is relatively easy, after the trials of building. I painted the engine parts Testors Flat Sea Grey (FS number ... obscured by paint smear! ); the top was 'Flat Light Aircraft Grey' (works out to FS 36622). Then I sat down and thought about weathering. The speeder is a military vehicle - and every military vehicle I ever encountered in ten years of active duty was rode hard and put away wet. Even the miracle technology of the Empire won't be able to disguise wear and tear encountered in the field. This means the bike should be dirty ... but not caked in mud, since it does float above the surface ... I decided to make the bike with dirt accumulated in crevices and scuff marks here and there. Weathering decisons made, I set to. I rubbed in graphite dust (obtained by sanding down the tip of a #2 pencil) to darken the paint and induce a metallic sheen. I 'highlighted' every angle and crevice with a wash of Euro-I Grey (FS 36081) or Flat Black to bring out the details. I dry-brushed silver on the footrests and various other places where you would expect wear, then went back with more graphite dust. I also picked out the lights and switches on the center console with red and green (lights) and Euro I Grey (knobs and switches). The seat is *not* black, as the box art suggests - it's grey, as are the twin booms sticking out from the main body. I coated the bike in Testor's Dullcote to get a flat finish, then attached the seat. The seat was finished with clear Semi-gloss to replicate a vinyl seat cushion. The results are pretty darn good, if I do say so myself. The Stormtrooper posed a few problems of his own. After filling, sanding, and cleaning up all the ickies on him, I had to decide how he'd look. All the images we've seen show clean and shiny 'troopers -- but years in the field with the infantry proved to me no one can stay that clean. I ended up compromising. The trooper was painted flat white over the primer coat. Areas where his undersuit showed through were painted flat black. 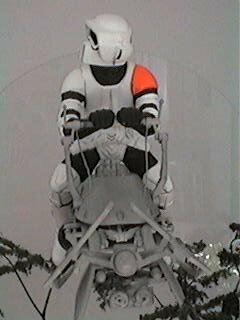 To break up this monochromatic black-n-white scheme, I painted one shoulder Testor's Gloss Orange, after the rank markings the one of the Mos Eisley Stormtroopers wore in A New Hope. After the white had dried for almost a week, I got down to detailing. I applied a Euro I grey wash to the belt area and any other equipment (things hanging off the belt, boot holster, etc.). The soles of the boots were painted tan - I didn't bother with scribing in tread patterns. A wash of FS 36622 Camoflauge Grey was applied to all folds, wrinkles, and depressions on the armor and boots. I then went back over all the areas that had received a wash, and dry-brushed Flat White on the highlights (to cover any over painting from the wash). Similarly, Euro I grey was dry brushed on all folds and wrinkles on the black parts of the uniform to bring out the detailing. Finally, the armor and goggles were coated with a layer of Future floor polish to replicate the sheen seen in the movies. Set the clear plexi stand into the black base by squeezing opposite edges of the base together so the gap in the center is widened. You may need, as I did, to place a few strip styrene shims underneath between the plexi and the base to keep it steady. After I'd done the above, I decided the base was too blah. I bought a & inch diameter wooden clock face at a craft store ($4), stained it, and glued the base on with clear silicone sealant (rbber cement also works). I then decided the base would make an excellent platform for a diorama. I chose a forest scene, reminiscent of Endor. A desert scene would also be easy to do (though I don't know how you'd model the dust kicked up by the engine wash) - as would a grasslands vignette. 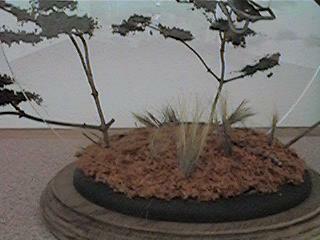 Small trees were made with twigs covered in green model railroad foiliage. A carpet of leaves was laid on the base using 'autumn' model railroad foilage. A few tall clumps of railroad grass were added - the ones in front of the plexi stand straight up; the 'grass' behind the plexi (and under the engine's down wash) are flattened against the 'ground'. 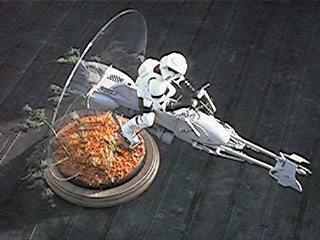 The base and turned head make the 'trooper looks as if he's cruising slowly through the woods, looking for someone or something. Where to Find This Kit. If your local hobby dealer doesn't have one, try Walmart. I've seen these everywhere - don't you wish B5 kits were this common? Star Wars names, characters and all related indicia are the property of Lucasfilm. Last updated 6 December 2000. This page copyright © 1997-2000 by Starship Modeler.